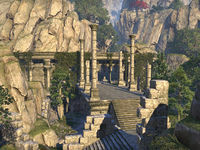 Some say Goblins originated in Summerset, and some say the High Elves brought them here to serve as menials and slaves. They no longer perform those functions, but freed or escaped, Goblin tribes still thrive in the island's loneliest corners. King's Haven Pass is a delve with two entrances found northeast of Cloudrest and east of the Illumination Academy. The following letters can be found here: The Tale of Syrabane, Praise Be, Restoring the Welwas. Explore and clear King's Haven Pass. 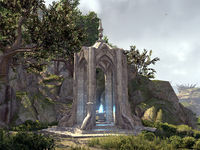 The King's Haven Pass Wayshrine is located east of King's Haven Pass' east entrance and west of Gryphon Aerie, near the road. This page was last modified on 19 November 2018, at 07:29.